I made crab soup for the first time ever. I found a recipe and tried to follow what I could and then add replacement items for stuff I didn’t have. I purchased crab meat in the grocery store about a week or so ago in hopes to make something with crab and all of the cold weather made soup seem like the perfect option. It was awesome. A little spicy and good flavor. And it made about 8 2cup servings. I had never made scalloped potatoes before today. I looked at over 5 recipes and wasn’t happy with any of them. So, I took bits and pieces of different recipes and added an idea of my own. Below is the result of the concoction. It is not the typical scalloped potatoes but all of the major ingredients are there and it tastes great. Plus, 4 out of the 5 ingredients are organic. The only ingredient I haven’t found in an organic variety is cream cheese… one day. Mix cream cheese, sour cream, and half and half in a bowl. Thinly slice potatoes, place in bowl with cheese mixture, and gently mix to coat potatoes. Spoon into 9″ x 13″ baking dish and scatter 2 oz of shredded cheddar cheese on top. Bake for about 1 hour until cooked through. Recently, we have been making our original Trail Mix recipe on the lighter granola side (maybe a winter thing) and since I make our granola from this blog every time, I thought I would update the recipe. 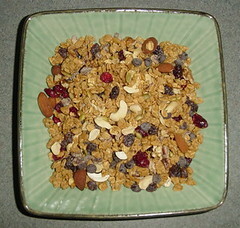 There are only 2 modifications: double all of the non-granola ingredients (or cut the granola in half with respect to the other ingredients) and remove the dates (we were not enjoying them) and replace them with 1/2 raisins and 1/2 cranberries. Products Recall” that has been in the news for a little while now. The FDA has a new list of the foods. Please check it out. I don’t want anyone I know getting sick because another stupid company wasn’t careful with food. So, please visit The Dinner Company located at 810 Beaglin Park Drive, Salisbury, Maryland 21804 in the same shopping center as the Old West Steak House on Saturday, November 1st thru Monday, November 3rd during the hours of 7am-7pm. Place chicken separated in bottom of baking dish. 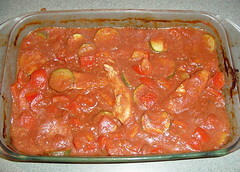 Cut up veggies and place on top of chicken in baking dish. Pour tomatoes and water over veggies and chicken. Check chicken temperature to make sure it is 165°F to verify it is fully cooked. Hard Boil eggs using desired method (See Egg Boiling Steps). Cut up hard boiled eggs into a large bowl. 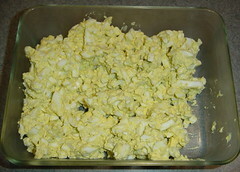 Add mayonnaise and mustard to eggs and mix thoroughly. After a long summer struggling to keep their facility open, The Dinner Company in Salisbury, MD is closing its doors. I received an email earlier this week letting me know and I was saddened to hear but understood – people are cutting back everywhere they can save a few dollars. They are staying in business though just modifying their business strategy in these trying economic times. They have reinvented themselves to exclusively a dinner delivery system. I considered the meal delivery option, however, I like preparing our meals and making adjustments when needed (that was one of my two favorite things about The Dinner Company – the other getting to socialize with the owners), so unless we are super busy, I feel as if we will be preparing our meals again. I have learned so much though that I have so many new tools at my disposal for preparing meals ahead of time now. Over the last couple months as I was hearing that they were having troubles but hanging in there, my husband and I started planning a back-up strategy (always have a back-up plan with as many things as you can). We wanted a way we could still have our prepared meals that we put in the freezer and then into the oven, but where we could modify things, should the opportunity arise. During out recent visits to The Dinner Company, we started to change over to glass dishes to store our dinners in the freezer to reduce waste and tried to put as many things into zipper plastic bags to reduce the space needed in the freezer. We also wanted to go more organic and natural with our food choices which The Dinner Company was moving to with using natural chicken, but they started thinking about moving to organic right before the economy started to suffer, so some of that got put on hold – understandable. We now have the opportunity to eat more natural and organic foods, decrease our packaging waste, and use the glass bakeware that we bought by preparing our own meals at home. For tools to get us started, don’t have to go out and buy much to prepare. 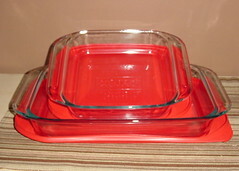 We already have the bakeware and lots of kitchen tools that we have collected over the years from places like Pampered Chef. The largest learning curve will be the oven temperature and length of time to cook the meals along with figuring out nutritional information and thinking of what to prepare for the next week or two. At the start, I believe we will prepare a week of meals ahead of time, however, I would like to move to preparing meals 2 weeks ahead of time to give more variety to choose from and less preparation time over all. Planning and preparing meals for a time will be more complicated, but we adjust well. Once we get into our new routine, all will be fine. At least I have a whole month to plan for the change since next week I get to pick up the meals for next month that we ordered and paid for at the beginning of this month. When I heard they were closing their doors, I was afraid that we would loose the money that we paid for these upcoming meals, but they are two wonderful people that are treating their customers well even when they are struggling. I am so proud of them and hope they succeed in their next venture. As a result of this new food cooking adventure of ours, I will now be posting meal creations with pictures, ingredients, and notes. How exciting!